2 December 2010, at 11:53a.m. UK - CP Foods, the UK division of the worldwide CPF Group, has added another industry award to its already growing collection. Pictured are Ruth Jenkinson, CP Foods UK, Alison Stokes, Tesco, Visarut Palarit, CPF Thailand. 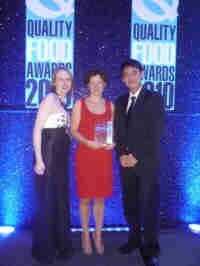 The added value producer picked up the Christmas Q Award for the production and development of Tesco Finest ‘Panko Prawns with Wasabi Mayonnaise’ in the Best Chilled Savoury category at the Quality Food Awards, which was held at Park Plaza in Westminster Bridge, London at the beginning of the month. With each entry being judged over ten intense days against a spectrum of criteria such as flavour, appearance, value for money, a clean ingredient list, packaging and the extent of innovation; the Panko Prawns managed to pick up some excellent judge's comments. Judges loved the authentic and innovative crumb coating that delivered ‘a really super panko crispness ... with a succulent prawn texture’ and thought the wasabi mayonnaise had ‘a real kick to it’. The Christmas Q category is made up of five different product areas and looked at the best products designed for the Christmas period. Tesco Finest ‘12 Oriental Bite Selection’ which CP also produce was shortlisted in the Chilled Savoury category.